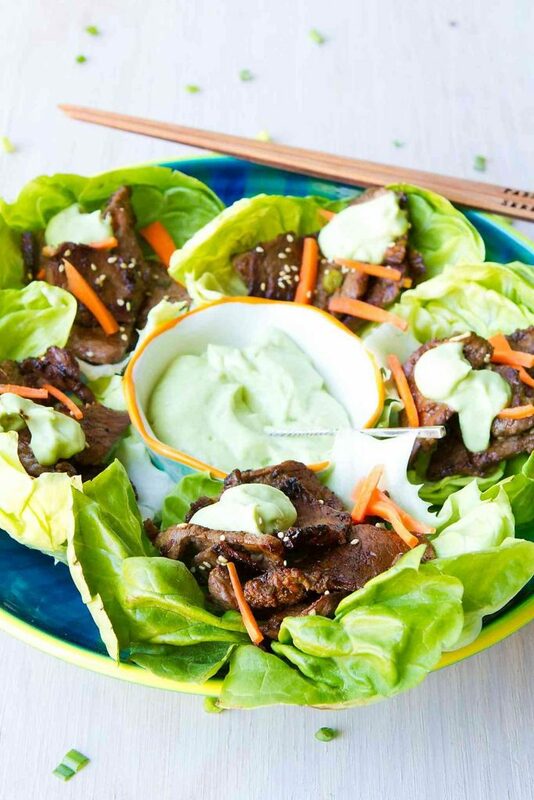 Dollop some creamy avocado sauce on top of these Korean BBQ Lettuce Wraps and serve them up as appetizers or entrees. Easy and delicious! 113 calories and 3 Weight Watchers Freestyle SP. Thank you to California Avocados for helping me share this recipe with you. Hallelujah! California Avocado season is here again! As soon as I cut open the creamy fruit, I start dreaming up California-inspired recipes (at least for the ones we aren’t eating straight with a spoon!) Cobb salads and shrimp tacos immediately spring to mind when I think of iconic California recipes, but I’m also drawn to the diversity of cultures and food in the state. About a decade ago, the Kogi BBQ Taco Truck was born in Los Angeles, melding Korean and Mexican food cultures and gathering crowds at roving locations by updating their rabid fans via Twitter. Ten year later, with several food trucks on the go and a couple of brick and mortar locations, they’re still going strong and satisfying their customers with short rib burritos, kimchi quesadillas and Kogi sliders. 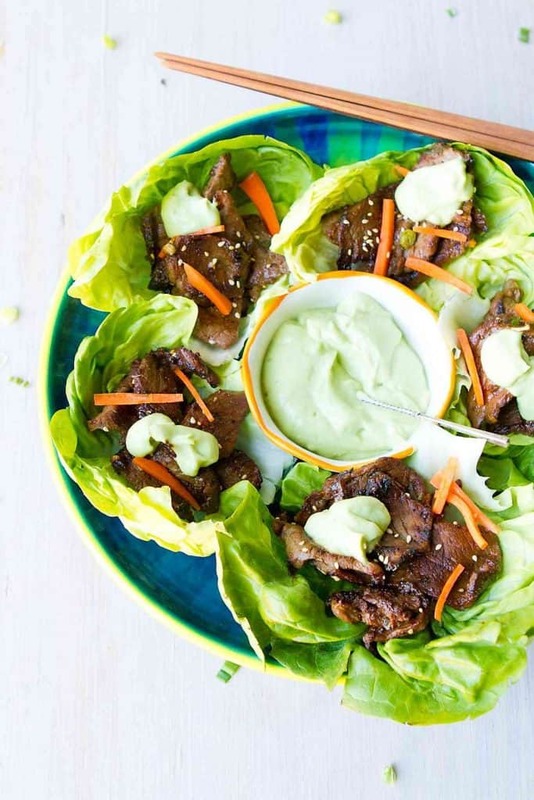 Korean bbq is a favorite with my family, and these lettuce wraps with a creamy avocado sauce are my version of an iconic California recipe, inspired by the Kogi BBQ food trucks. You may already be familiar with bulgogi, which is a Korean dish comprised of thin beef slices that are marinated in a savory sweet sauce and then grilled. It’s typically served either with rice or lettuce leaves, often with sides of Korean vegetables. Now that grilling season is here (or almost here for some of the snowier states) and California avocados are in abundance from now through October, it seemed like the perfect time to marry this Korean barbecue recipe with a creamy avocado sauce. There are a couple of tips to making bulgogi (none of them difficult, I promise). • Start with a tender cut of beef, such as sirloin or tenderloin, and cut it into thin slices. Freezing the beef for about an hour makes it even easier to slice. Plus, a sharp knife is essential! • The marinating time is key with this recipe. 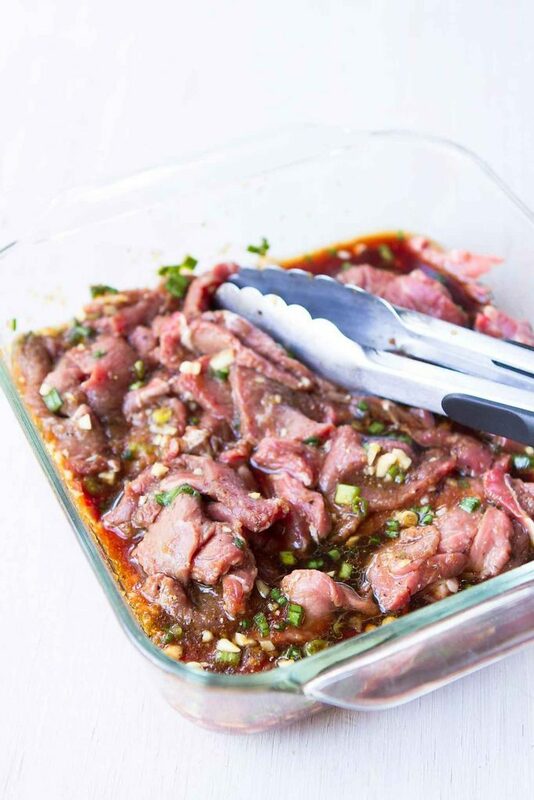 If you want to make the bulgogi for dinner tonight (I get it…I don’t always want to wait), be sure to marinate the beef for at least one hour. If you can marinate it overnight, you’ll be rewarded with beef that is even more tender and flavorful. 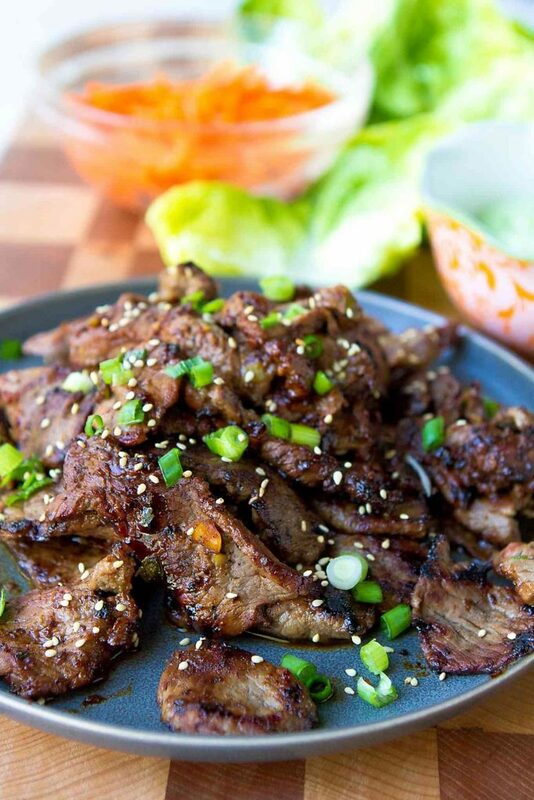 • One of the key ingredients for a Korean bbq marinade is Asian pear, which can be found in many grocery stores. Cut it in half, remove the core, then grate half of the pear over a bowl, using a microplane. Add the grated pear and accumulated juices to the marinade. The pear acts as a tenderizer for the beef. • Use a large cast iron skillet or a grilling pan set over medium-high heat to cook the beef. Cook it in batches so that the pan isn’t crowded. If it’s too crowded, the beef will steam rather than charring. And believe me, you don’t want to miss out on those gloriously charred pieces! The avocado sauce is as simple as combining one avocado in a blender with some coconut milk, lime juice, chili garlic sauce and a splash of water. Puree until smooth. This sauce is fantastic with this beef bulgogi, but also works with chicken kabobs, roasted potatoes and even eggs! The last step? 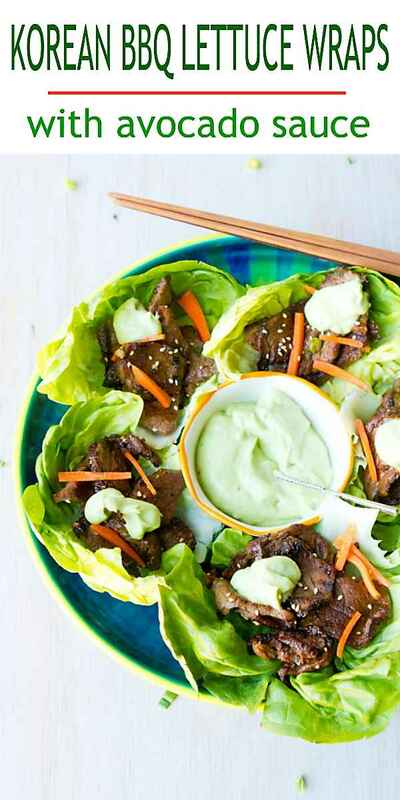 Divide the beef between the lettuce leaves and top each with a dollop of the avocado sauce. Serve the lettuce wraps as a appetizers or as the main course! In a medium bowl, whisk together the soy sauce, mirin, agave nectar and sesame oil. Over a bowl, grate the Asian pear on a microplane. Add the grated pear and juices to the soy sauce mixture. Stir in the garlic and green onions. Add the beef slices to the soy sauce marinade, toss to coat, cover and refrigerate for at least 1 hour and up to 24 hours. Remove the beef from the fridge about 20 minutes before cooking to bring to room temperature. Heat a large cast iron skillet or grill pan over medium-high heat. If using a cast iron skillet, add 1 teaspoon of canola oil and swirl to lightly coat the pan. Cook the beef in batches, shaking off any excess marinade before adding to the pan. Cook until the beef is charred and cooked through, 1 to 2 minutes per side. Transfer to a plate. Repeat with the remaining canola oil and beef. Divide the head of lettuce into separate leaves. Divide the beef evenly amongst the lettuce leaves and top each with 2 teaspoons of the avocado sauce. 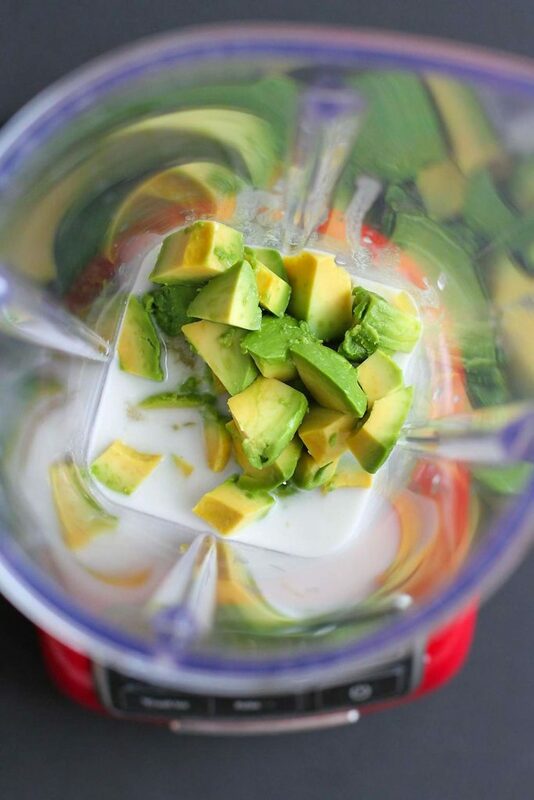 In a blender, combine the avocado, coconut milk, water, lime juice, chili garlic sauce and salt. Puree until smooth. Oh, how I love that you used Asian pear in these. I love the flavour it gives bulgogi. These are so darned good! Making this one for dinner tonight, I think. Looks amazing!! Lettuce wraps are one of my favorites, love that Korean bbq flavor! I love bubgogi and this healthy version is just my style!!! 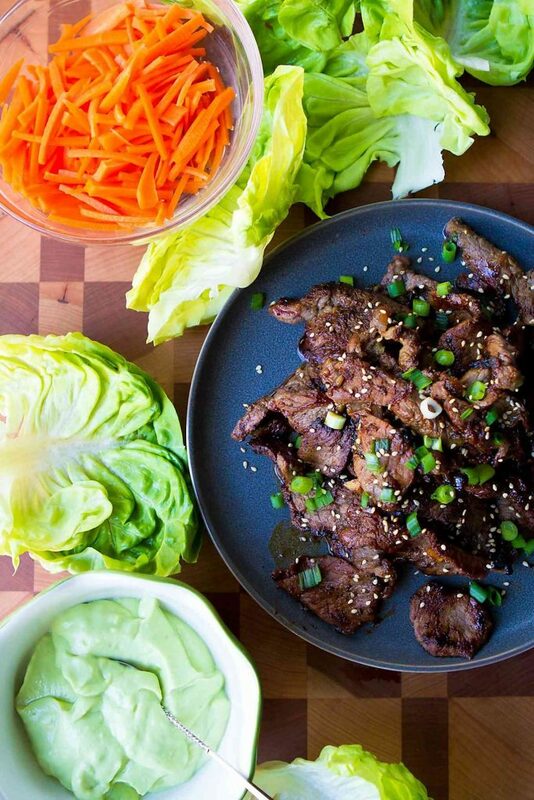 These Korean BBQ lettuce wraps look so delicious! And I love, love, love avocado! Perfect light lunch or dinner! I’ve added to my dinner plan for next week. This is totally my kind of dinner! I love how easy it is. That beef looks amaaaaazing! I wish there were taco trucks here in the sticks of Vermont! I would eat myself silly!